MGA’s Dynamic Series equipment solutions are pneumatically driven systems that are designed to perform testing, according to specific regulations. These systems are designed so that all related standards from various regulatory agencies that address a particular safety issue, are satisfied with one machine. 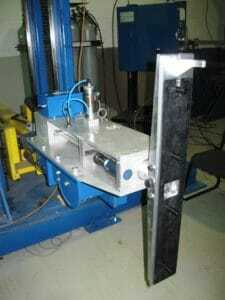 The equipment can also be used in a general manner to introduce kinetic energy to various components under test. A dynamic impact system generally consists of four parts: control and propulsion system, dynamic impact frame, dynamic impactor, and data acquisition system. Specialized impactors are used to propel different impact forms with a wide range of masses at various velocities. In many cases, customers will purchase more than one impactor and interchange it depending on the type of test being conducted. MGA’s new frames include position memory and automated positioning with wireless control. The frame uses servomotors and encoders for position measurement, along with servo drives for motor control. MGA’s Free-Motion Headform (FMH) test system is considered an industry standard in laboratories across the world. The test system is used for conducting occupant head impact simulations on the vehicle upper interior. MGA has conducted NHTSA compliance testing for FMVSS 201U since 1999 and uses the same equipment in our laboratories as offered in this system. The complete package consists of a nitrogen-based propulsion system with an easy-to-use touchscreen interface, robust multi-axis test frame, state-of-the-art impactor, targeting program, calibration station, and various data acquisition/data processing options. Training is also offered from experienced MGA test personnel who perform FMVSS 201U as well as many other dynamic test standards. See Free Motion Headform System in our catalog. The Linear Impact System is one of the most versatile systems offered by MGA. Hundreds of different types of impact tests can be conducted using this equipment. 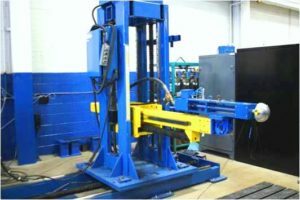 The main features include the ability to interchange impactors, vary the impact mass by adding customized impact forms, and vary pressure to achieve a multitude of impact speeds. The most popular types of tests include those for FMVSS, automotive components, foams, plastics, polymers, etc. The complete package consists of a nitrogen-based propulsion system with an easy-to-use touchscreen interface, multi-axis test frame, state-of-the-art impactor (chosen for your specific application), and various data acquisition, airbag deployment, and data processing options. Training is also offered from experienced MGA test personnel who are recognized experts in the testing field. See Linear Impact System in our catalog. MGA offers a test system solution that is compliant with the latest Federal Motor Vehicle Safety Standard (FMVSS) 226 Ejection Mitigation. The test system is used to evaluate countermeasure designs that are intended to reduce occupant ejection in rollover or side impact events. MGA uses this same test system in its own facilities for conducting government compliance, OEM, and supplier testing. The complete package consists of a nitrogen-based propulsion system with an easy-to-use touchscreen interface, multi-axis test frame, state-of-the-art impactor, and various data acquisition, airbag deployment, and data processing options. Training is also offered from experienced MGA test personnel who perform FMVSS 226 testing as well as many other dynamic impacts. This testing requires multiple interior change-outs between tests. The system includes automatic impactor positioning to ensure repeatable testing is conducted. Pedestrian Protection is a worldwide safety issue that continues to evolve and develop with each year. The current test protocol is used to evaluate the vehicle front exterior for countermeasure designs that are intended to reduce a variety of pedestrian injuries. Over the last decade, MGA has supported this effort through the development of an innovative equipment system, including a state-of-the-art FLEX-PLI launcher. The complete package consists of a nitrogen-based propulsion system with an easy-to-use touchscreen interface, multi-axis test frame, several state-of-the-art impactors for the head, lower leg, and upper leg, calibration stations, and various data acquisition, pyrotechnic activation, and data processing options. Training is also offered from experienced MGA test personnel who perform Pedestrian Protection testing for customers throughout the automotive industry. See Pedestrian Impact System in our catalog. MGA’s Drop Tower is designed to be a multi-purpose tool for the investigation of various dynamic impact events. As an impactor, this system can be used for hundreds of different impact events by varying the mass, height, and impact form of the drop carriage. 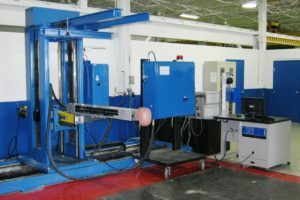 This is desirable for testing on automotive components, foams, plastics, polymers, etc. As a shock machine, this system may also be used to create a pulse of desired parameters that is transmitted into the test sample. The most widely requested application of this system is for military components subjected to mine-blast simulations. The complete package consists of a robust vertical frame with a customized drop carriage, release mechanism, and various data acquisition / data processing options. Training is also offered from experienced MGA test personnel who have years of experience with virtually every application for this system. 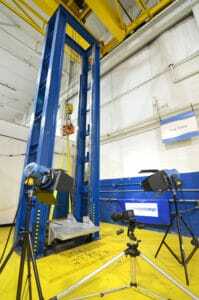 In addition to the drop tower, MGA offers a vertical pneumatic impact system for use in IED simulation and to validate the vertical sensors in dummies prior to live blast testing. See Blast/Drop Impact testing in our catalog. John Gizowski at john.gizowski@mgaresearch.com or by phone at (248)577-5001.